that I have never seen! NGC 6302 is a gaseous nebula in the constellation Scorpius which surrounds an immensely hot white dwarf star. 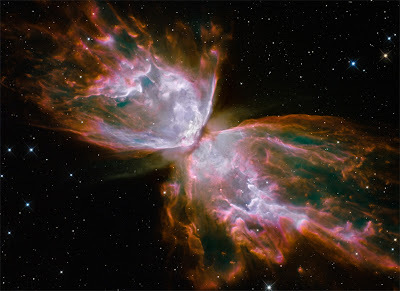 It has one of the most complex planetary nebula structures known. The cloud is unconscionably gigantic, with lobes extending out as far as two light years (12 trillion miles) from the central star. Given that it is located approximately 3,400 light years (20.4 quadrillion miles) from Earth, it is in no conceivable way a structure which I will ever have the opportunity to visit, even if someone invented fast-as-light space travel tomorrow. Add to this the fact that the photons we see today left the nebula over three thousand years ago, and it is also true that the nebula as it exists now no longer looks like the picture above. It is both a wonder and a sadness that we humans have developed brains which can conceive of a universe so vast as to literally be forever beyond our individual grasp. I suspect we are the only species on this planet which can not only contemplate our own individual extinction—intellectually, if not emotionally—but also conceive of a future world—happy, beautiful, alive—without our own presence. We need not turn our eyes to the stars to do so, either. What will the world be like when winter comes without a spring that I shall ever see? What will my children and grandchildren and future generations of human beings see, and do, and experience? How I should like to see what they will see. How I should like to see just one more spring after my last winter.